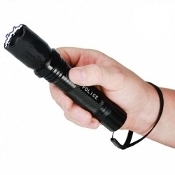 Yeah, it's a super bright Led flashlight, but it's much more than that! This unit offers solid comfortable handle with easy access to the control buttons. With 1,000,000 Volts of power, you'll have no problems taming the biggest of "pests". Nylon wrist carrying strap is included.